Modern TVs are sold largely on the viewing experience – HD-ready TVs complement the HD channels springing up, LED backlighting provides much higher contrast images, while 3D technology is bringing the success of 3D cinema into the home. Today’s TV screens are flat (no more bulky cathode ray tubes) and can be very large indeed – 55 or even 60-inch screens are not uncommon. To meet the demand for large display panels, manufacturing machines have reached impressive proportions and modern LCD fabs for LCD TVs can process sheets of glass the size of a pool table. In the 1990s when LCDs were first commercialised, production plants began with generation one (G1) processing technology, which used glass sheets approximately 30 x 40cm, equating to a 15-inch panel. Now, popular fab sizes are G7.5 (1.95 x 2.25m) and G8.5 (2.2 x 2.5m). Sharp’s LCD plant in Sakai city in Japan, houses G10 production technology, with the capability to process LCD panels on glass substrates measuring 2.88 x 3.13m. The majority of flat panel displays are thin-film transistor liquid crystal displays (TFT-LCDs) with market growth being driven mainly by LCD TVs. Plasma and OLED displays occupy a smaller share of the market. The basic structure of a TFT-LCD is a layer of liquid crystals sandwiched between two glass substrates. The front glass substrate is fitted with colour filters while the back glass has thin-film transistors (TFTs) fabricated on it. Applying a voltage to the TFTs causes the liquid crystal to change state, effectively switching from transparent to opaque. The TFTs therefore control the pixels by letting light from a backlight unit through or by blocking it. Each pixel will have red, green and blue colour filters (or subpixels) to produce a colour image on the display. TFT-LCD manufacture breaks down into three main processes: producing the TFT and colour filter arrays; cell assembly, in which the two arrays are filled with liquid crystals and the cell is then cut into segments depending on the final product; and module assembly, in which the panel is attached to the driver electronics allowing it to display TV video. Overall, there are more than 300 processes involved in TFT-LCD manufacturing lines. ‘There are many automated optical inspection (AOI) processes employed right from the very beginning,’ explains Xing-Fei He, senior product manager at imaging specialist Dalsa. Before the production process begins, the bare glass is inspected to check for uniformity in transparency and defects, such as cracks around the edges. TFT and colour filter arrays are checked, as are the edges of the glass on the module, the backlight, and the polarisation film on the surface of the display. Dalsa’s Piranha P3 12k line scan cameras have been used in a colour filter AOI system developed by Utechzone, a company based in Taiwan producing AOI systems for PCB and LCD manufacturers. The AOI system is installed on a G8 production line (2.2 x 2.5m displays) and consists of around 20-30 cameras in a line. The system is used to inspect the mura (or unevenness in the screen, which causes a clouding phenomenon), the ITO (a transparent conduction layer in the glass), RGB colour filters, and the black matrix. Black matrix is deposited around the subpixels as a technique to increase the image contrast. ‘TFT array inspection is the most difficult part of the inspection process because the resolution required is very high,’ comments Xing-Fei, adding that cameras have to resolve structures down to approximately 1-3μm. Inspecting the colour filters is similar to TFT inspection, he says, although the resolution does not need to be quite so high (~5-10μm) and illumination can be either reflected light or backlighting. With TFTs, however, Xing-Fei says that cameras with TDI (time delay and integration) capability are required. ‘One of the most important aspects of LCD manufacturers is throughput,’ states Xing-Fei. 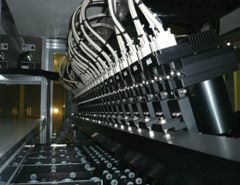 ‘Fast inspection allows higher throughput and manufacturers invest billions of dollars on production lines to maximise the throughput.’ Obiora Okoye, international business development manager at camera company Lumenera, also identifies high-speed image capture as a prerequisite for any imaging system used in flat panel display inspection. Lumenera’s Lu130 CCD camera is used for optical analysis of all forms of flat panels, including LCDs and solar panels. The Lu130 is a USB camera with 1.4 Megapixel resolution and 15fps frame rate, making it suitable for high-speed inspection of macro defects such as cracks and other abnormalities in the panel. ‘The fast frame rate is important for flat panel display inspection and the relatively low resolution (the camera family goes up to 16 Megapixels) allows high throughput,’ comments Okoye. Camera Link systems are typically used, as the standard has a high enough bandwidth to handle the resolution of the camera and the throughput of the machines. Euresys’ Grablink Full frame grabber supports full-configuration Camera Link. High throughput production lines require high-speed cameras with fast line rates. One of the problems with moving to higher line rates is that a stronger light source is required to illuminate the object. ‘In TFT array inspection, the illumination source is typically metal halide lamps, which aren’t high enough intensity for the line rates of the cameras,’ explains Xing-Fei. One solution Xing-Fei suggests is TDI technology, which uses multiple exposures to increase the responsivity of the camera. For example, Dalsa’s High Sensitivity HS 8k has a 96-stage TDI, which means the camera is around 100 times more responsive than a standard line scan camera. This allows faster line rates even with a weak light source. A third issue Xing-Fei identifies is the optical lens, which can limit the resolution for imaging the micrometre-scale components of TFTs. ‘Imaging below 5μm pixel resolution is very challenging,’ he says. The latest Dalsa camera suitable for TFT array inspection is the High Sensitivity HS 12k 5.2μm TDI, with 256 TDI stages and 90kHz line rate. The camera is being designed on the latest generation TFT-LCD production lines. The backlight unit is a very important part of an LCD display, providing a global light source with the TFT controlling the amount of light passing through individual pixels. ‘In a large 42-inch LCD TV the backlight could account for more than 40 per cent of the cost,’ explains Xing-Fei. Most TVs in the market use fluorescent tubes, although LED lighting is now increasingly being used. ‘In the future, LED backlights will dominate the market because they provide high colour quality and are energy efficient,’ Xing-Fei says. A fluorescent tube produces a broad spectrum of light, with RGB filtered out. LEDs can provide the individual RGB colours, which makes it much more efficient and gives a better contrast. Damhaut notes that inspecting LED panels poses new challenges, as there are technologies available in which the backlight generates more or less light depending on the contents of the images. ‘The newest LED TVs include technology in which certain areas within the backlight unit can be dimmed or switched off in order to improve the contrast ratio of the image on the screen. If part of the image is black then the backlight for this area is switched off to provide a much higher contrast ratio between the white and the black pixels,’ he says, adding that this capability also has to be inspected, making inspection more complex. In Damhaut’s experience, inspecting the finished display is carried out manually – the operator switches on the panel and uses test images to reveal any defects. However, the rest of the manufacturing process relies on machine vision in varying degrees of optical inspection capability. Okoye of Lumenera notes the increase in automation now present in flat panel display production lines and machine vision is a big part of that. Xing-Fei says: ‘The industry works to a zero-defect target – no defects in six million subpixels. This inspection process is completely dependent on machine vision technology – on high resolution line scan cameras at 8k, 12k, or 16k; at high speeds.’ With the increase in the size and resolution of displays along with new technologies taking hold, such as 3D TVs, automated inspection continues to be an important part of flat panel display manufacturing.